Successful businesses started with an idea. Somewhere between the idea and today’s success, an entrepreneur worked through the idea to create a business model, a brand, a sales funnel, a business plan… and then they implemented those things. There are many people who want want to start a business but can’t seem to get their idea off of the runway. They have a vague, loosely-defined business idea but aren’t sure what to do next. (“I’d like to consult about marketing” or “I’d like to work on cars” or “I’d like to become a real estate investor”, etc.). These are good ideas, but they aren’t enough to move forward with. Here’s a tool I developed a few years ago to help people solidify their idea into a strong foundation on which they can create a business. It’s called the Business Palette. The Business Palette is for people who have a business idea and now need to turn it into a business model, or who want to start a business but need help nailing down what they want to do. 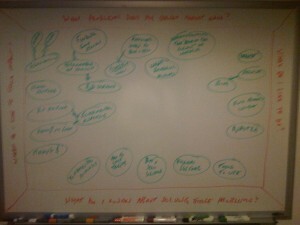 I’ve used the Business Palette to help several clients who wanted to start a business but weren’t sure where to start. In painting, a palette is a tray that contains some basic colors, and you mix those colors to create unique colors to use on the canvas. The Business Palette works the same way: You start with some basic ideas and you mix and match to bring clarity and focus to a single business idea that you can move forward with. From there, starting a business is much easier. What problems does my target market have? 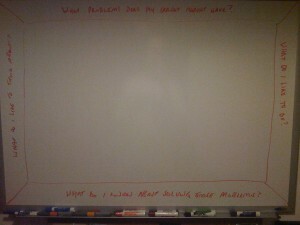 What do I know about solving those problems? You can see that I’ve done that, below, in red, and left lots of blank space in the middle of my palette. Now it’s time to fill out your palette with some basic ideas. Beside each of the sentences you wrote in the previous step, list as many relevant ideas as you can. You’ll likely include your business idea in one of these four areas (in my experience, a vague, unrefined business idea consists of one or two of these elements). Be sure to fill out each of the 4 areas and exhaust your thinking in those areas. Do some research, if necessary, to answer the “What problems does my target market have?” question. Notice that it’s very similar to a guided brainstorm. As you write down some of your ideas, subordinate ideas will come. Write them all down! And I should also point out: You don’t have to do one at a time. Just fill them in as they come to you. And you may find that you repeat an idea on a couple of different sides of the Business Palette. 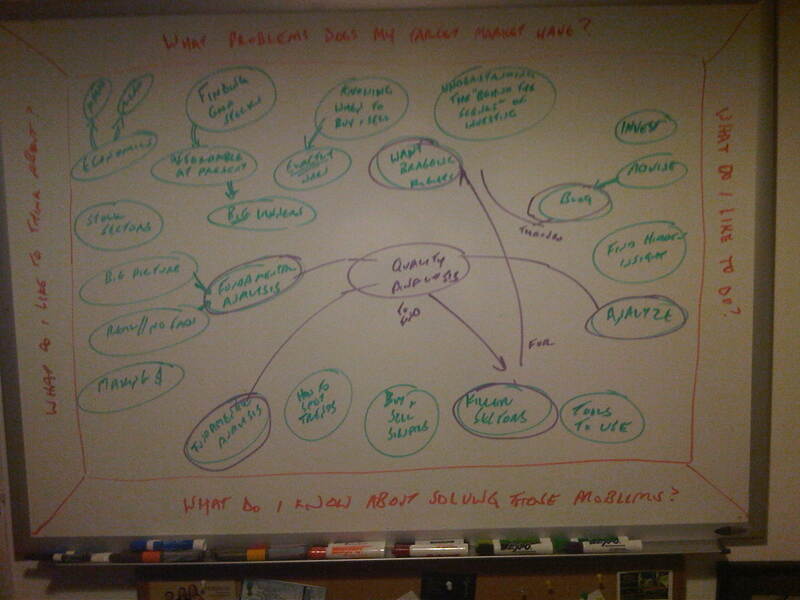 Across the top, where I’ve written “What problems does my target market have?”, I list the problems that the average stock investor faces: “Knowing exactly when to buy and sell”, “Finding good stocks at affordable prices that turn into big winners”, “A desire for bragging rights”, and more. Across the bottom, where I’ve written “What do I know about solving those problems?”, I list some things that I can do (based on my previous experience as a stockbroker): “Fundamental analysis”, “How to spot trends”, “Buy and sell signals”, “Killer sectors to invest in”, and more. 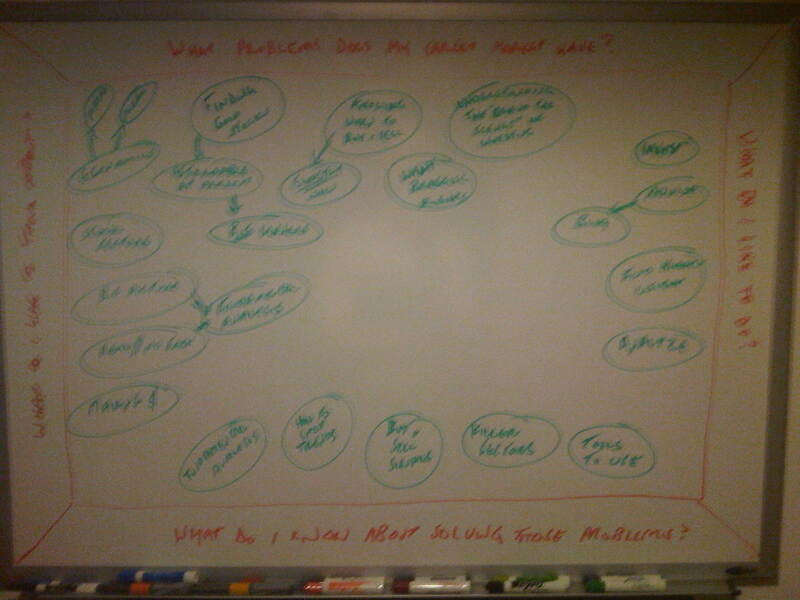 Across the left, where I’ve written “What do I like to think about?”, I list topics that I would love to get paid to ponder: “Ecomomics”, “Stock sectors”, “Fundamental Analysis”, and more. Across the right, where I’ve written “What do I like to do?”, I list the activities that I would love to get paid to perform: “Advise”, “Blog”, “Analyze”, and more. STEP THREE: MIX THE IDEAS TO BRING CLARITY TO YOUR BUSINESS MODEL! Now that you’ve put down the basic “colors”, you can now start mixing and matching. You’ll notice right away that many of the basic ideas tend to be related, and they can all theoretically mix together. In my example, there’s no reason why they won’t all somehow play a part in my business. But hopefully you listed more ideas in your real Business Palette (compared to my example) and you can discard some ideas. Other ideas that tend to be related should be considered but don’t have to be included. It’s likely that many of the related ideas will play a role in the future, but right now you’re looking to bring your business idea into focus, so don’t connect all of your ideas together. Connect some of them together and you’ll end up with something far more compelling. Experiment with different combinations in the same way a painter would. After a while, you’ll end up with a few good ideas and a bunch of mediocre ideas and a few bad ideas. That’s exactly what you want. In my own example, I didn’t list all of the ideas, I just picked one (because I was running out of room — sorry about that). That’s a good starting point. It might require more tweaking. Or if I continued to connect ideas, I might find something better and more focused. But this is a good starting point because it brings together problems and solutions and my own expertise and interests. The idea I’ve listed above is definitely a business I would enjoy starting! Once you’ve completed the Brand Palette, you essentially have a nicely defined business model! 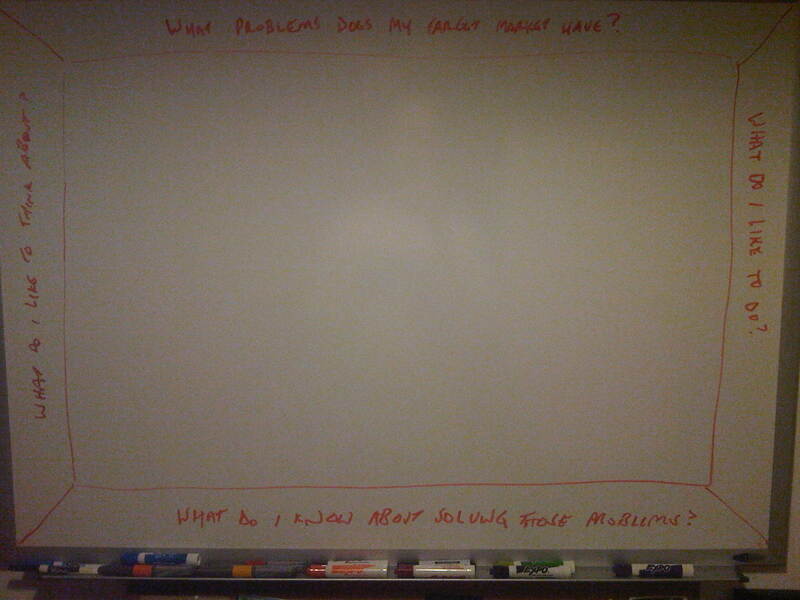 You know what problems you’re solving and how they’re getting solved. In most cases, you’ll know what you’ll actually be selling. Develop your brand. Create a strong brand that resonates with the elements you’ve included in your Business Palette. Check out this related blog post: When your product’s benefits just aren’t enough. Create a sales funnel. Create a simple sales funnel that you can build, implement, automate, and scale. Check out these related blog posts: 3 tips to remember when building a sales funnel for your business and FAQ: I want to build a sales funnel. Where do I start? Once you’ve done these three things — built a business model with the Brand Palette, developed your brand, and created a sales funnel — you have everything you need to write a business plan (in fact, most of your business plan is already created by these three pieces)… so you’re ready to start your business! If you have an unrefined business idea that needs some clarity, grab your markers, head to the nearest whiteboard or posterboard, and create a Business Palette. Bring some focus to that idea by mixing and matching Business Palette ideas to create a compelling business model! If you tried it and it worked (or if you have questions), post a comment. I’d love to hear how it worked for you.